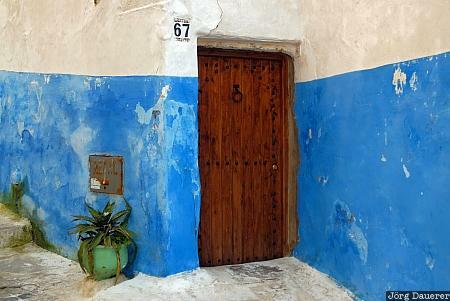 A door, a blue wall and a flower pot in Kasbah des Oudaias, the old part of Rabat. Rabat is in Rabat-Salé-Zemmour-Zaër, Morocco. This photo was taken in the morning of a sunny day in March of 2010. This photo is part of the exhibition The color Blue (June 2011). This photo was the image of the month in October of 2014. This photo was taken with a digital camera.